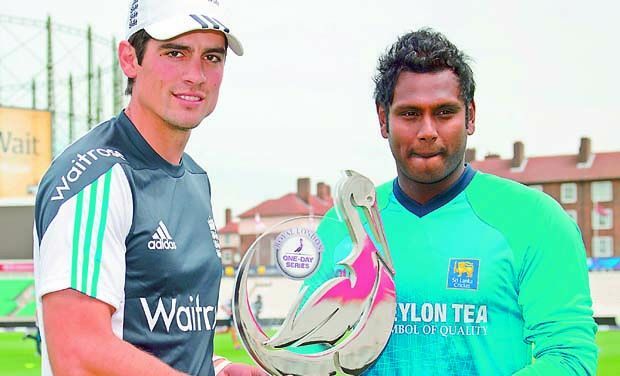 Captain Cook has sailed to Ceylon to meet Lankan lions in a long ODI series. This will be their dress rehearsal for the next year’s world cup and they are not going to take it lightly. Both teams have been humiliated by our men in blue. England learned a lesson at home that Indian’s can’t be written off even when they are struggling on fast pitches. After an impressive triumph in Test Series England were reduced to a team of middle age villagers in the ODI series. Reluctant Sri Lankan were shown no mercy by their Northern neighbors and it was a whitewash for India. However hosting England at home soil will be a different ball game for Sri Lanka. At home every one is Lion goes the saying in our country which is so true in Cricket. This series is a long series with 7 ODI being played, this will be a tiring experience for Sri Lanka as well as for touring England. Sri Lanka will not get enough time to regroup after India nightmare whereas England haven’t played a lot of Cricket in past few months and they can be rusty. Moeen Ali will play import role in England’s team. He has been promoted in batting line and his spin can be England’s trump card. Ian Bell is always reliable but what about Captain Cook. Cook has not cooked a lot and he might fade away in obscurity. I don’t have much hope from him. Eoin Morgan is the one who Lankans would like to contain. If he is left loose then he can win matches for England on his own. Some of England’s fast bowlers can be effective but don’t expect much from them on slow pitches. Sri Lanka will go for few experiments in an attempt to bring the best for the World Cup. Frequent changes are expected and can they discover any new mystery spinner in the process? Who knows, this tiny Island has always produced world class fascinating Cricketers. Old guards are gone and it’s time to infuse some new blood in the team. On subcontinent pitches England are prone to choke however sometimes they manage to nick one or two matches as well. If not a complete whitewash for Sri Lanka they can manage at least 3 or 4 victories. My prediction is that Sri Lanka will win the series comfortably. Watch out for weather, it’s not so sunny down south and rain can eat up few matches and expect some disruptions as well. Follow back/lay strategy at Betfair. Always back Sri Lanka. Wait for higher odds for SL and move in when time is right. Lay at interval if SL bats first. If SL is chasing then be careful. If England bats first and scores around 300 then SL can choke. In any case never let trading go beyond 20 overs in 2nd innings. Always try to green up and cashout at interval no matter which team is looking strong. If I get time then I’ll be drop by at Betting Adda and give predictions for each ODI. munna bhai sa batting.. who will win..?? and how mch min mony i shd put in account to trade in betfair..?? tel me in indian rs.. tnq..
Munna bhai, pls give prediction on Carlton Tri-series !! !